Julie Swain, co-owner and founder of Dog Not Gone, poses with her dog, Max, on Nov. 1, at Maine Stitching Specialties in Skowhegan, where Dog Not Gone products are manufactured. Dog Not Gone is a Kingfield-based company that creates and sells dog and human apparel and accessories that improve visibility while outdoors and repel ticks, mosquitoes and blackflies. Alice Quirion of Skowhegan sews together a Dog Not Gone dog vest on Nov. 1, at Maine Stitching Specialties in Skowhegan, where she has worked since 1996. Since Dog Not Gone was established in 2005, Qurion has been making products for the company. 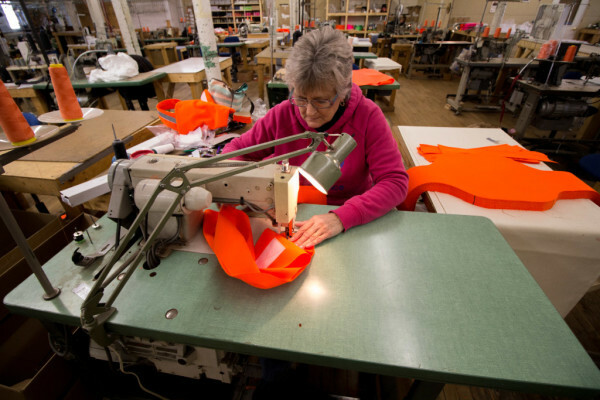 Sherry Jewell of Smithfield sews reflective material on the neck piece of a Dog Not Gone dog vest on Nov. 1, at Maine Stitching Specialties in Skowhegan, where she has worked since 1981. Since Dog Not Gone was established in 2005, Qurion has been making products for the company. Max the dog displays a Dog Not Gone Safety Dog Vest. 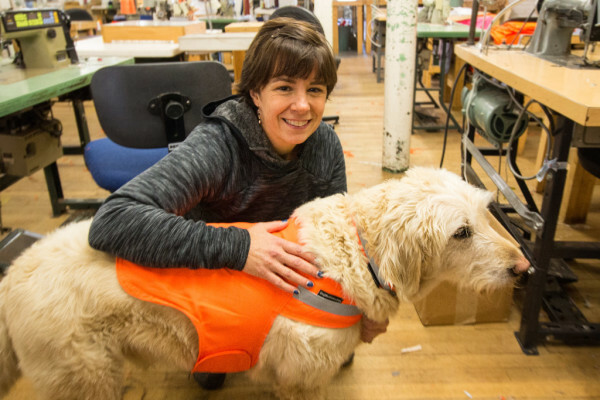 Dog Not Gone, a small company based in Kingfield, is owned by Julie and Bob Swain and manufactures its products at Maine Stitching Specailties in Skowhegan. The Safety Dog Vest was the company's first product when it was established in 2005. 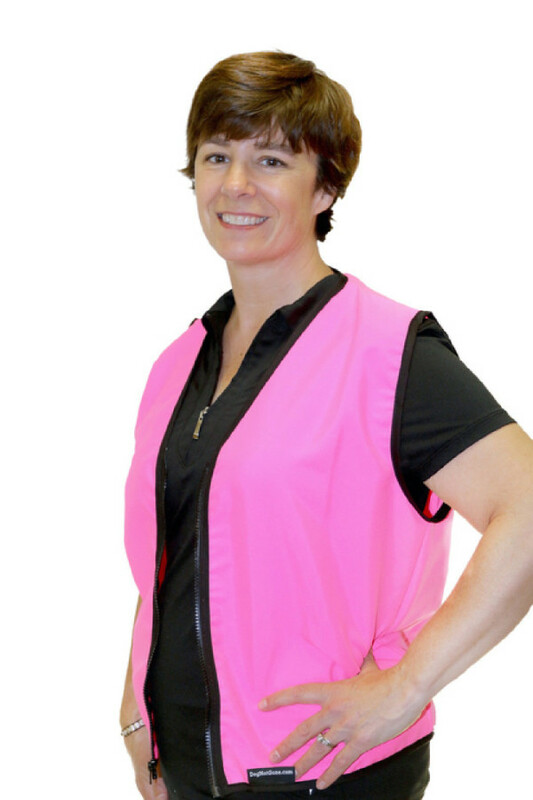 Julie Swain, co-owner and founder of Dog Not Gone, models the neon pink Dog Not Gone tick- and mosquito-repelling vest, launched by the company in January 2016. The vest is made of No Fly Zone, a fabric treated with permethrin and patented by Burlington Labs. Ticks, mosquitoes and blackflies — these three pests plague anyone who spends even a little time outdoors in Maine. And recently, as more and more tick- and mosquito-borne diseases are affecting the population, these tiny creatures aren’t just an annoyance. They’re outright dangerous. Dog Not Gone, a small company based in Kingfield, is offering a solution. Recognizing the need for people to protect themselves and their pets, this family-run company has recently expanded its product line to include outdoor apparel and accessories made of No Fly Zone, a permethrin-treated fabric that effectively repels ticks and other pests, including mosquitoes and blackflies. The company started out making products just for dogs, this past January, but the new line is for humans. Permethrin, an insecticide recommended to the general public by the U.S. Centers for Disease Control and Prevention, is bound to the fibers of No Fly Zone fabric through a process patented by Burlington Labs, an innovative textile company based in North Carolina. This nontoxic aspect of the technology is important to the Swain family. Living in the western Maine mountains, the Swains enjoy skiing and hiking with their two children, ages 6 and 10, and their 8-year-old dog, Max. So they’ve had plenty of opportunities to test their own products. This past spring, in the midst of blackfly season, Julie Swain hiked up Bald Mountain in Oquossoc with a group of friends. Naturally, she outfitted her group with Dog Not Gone products: vests, hats, kerchiefs and gaiters made of No Fly Zone material. No one in her group got bitten by black flies, she said. Meanwhile, they passed other hikers who were complaining about the bugs. Today, the Swains sell Dog Not Gone products directly to about 100 businesses throughout New England, and their distributor sells their products to about 100 more. Their customers include L.L.Bean, Reny’s, Amazon, Blue Seal, Wal-Mart, Orvis, Kittery Trading Post, Maine Military Supply, and many small pet stores and hardware stores in Maine and New Hampshire. Looking at their long list of customers, it may encourage other small business owners to know that Dog Not Gone started out as a “hobby business” in 2005, selling at local craft shows. And at the time, they had just one product: a blaze orange dog visibility vest. With a business degree from Bentley College, Julie Swain used to own and run a fleece clothing store, Carrabassett Polar Wear, in Kingfield. One day, a group of bird hunters stopped her store. Among them was Patti Carter, current president of the North American Versatile Hunting Dog Association Yankee Chapter. Dissatisfied by the dog safety vests on the market, Carter created her own dog vest design and wanted Swain to make it. They made a deal. If Swain created the dog vest and supplied the group of hunters for life, she could have the design for her own business ventures. 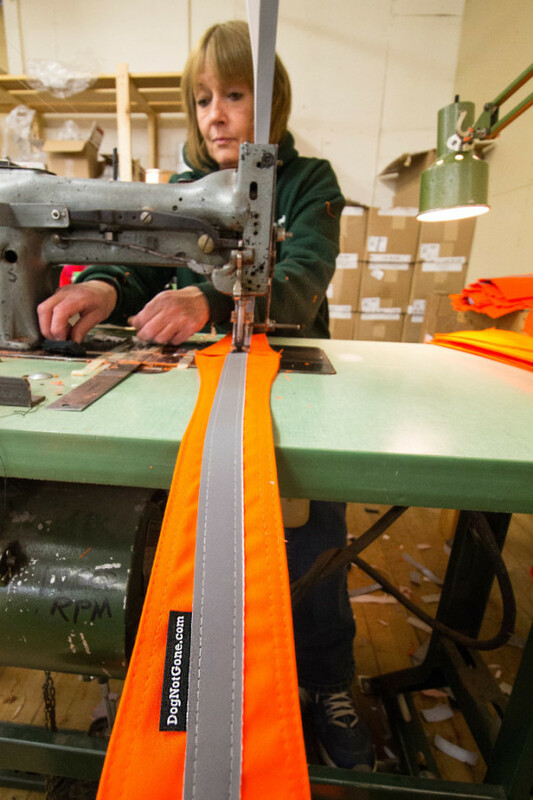 So they started manufacturing the Dog Not Gone vests at Maine Stitching Specialities, a factory in Skowhegan with a long history of producing quality textile goods. Over the years, Dog Not Gone reached more customers through national pet shows, sportsmen’s shows and through word of mouth. It wasn’t until about two years ago that Dog Not Gone really took off. In 2014, the Swains purchased Maine Stitching Specialties. It was also during that time that L.L.Bean approached them with the proposal that Dog Not Gone use No Fly Zone to produce a line of tick- and fly-repellent products. 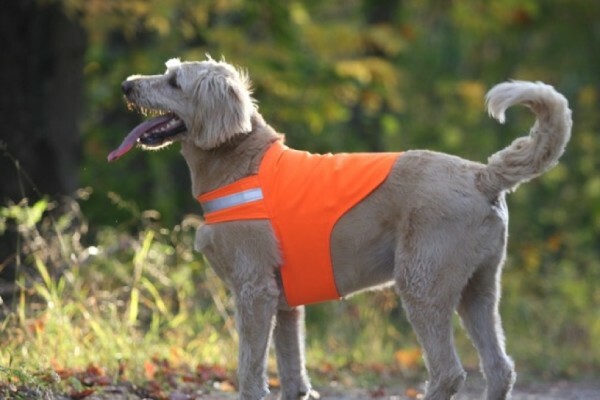 Pairing high-visibility colors and insect-repelling technology, Dog Not Gone sells No Fly Zone dog vests, collars and collar kerchiefs; horse vests; and vests and accessories for humans, including hats, bandannas and gaiters. Dog Not Gone products made of No Fly Zone are good for 70 wash cycles, Swain said. But if you air dry the product after washing it, the repellent should stay active for the life of the garment. Looking to the future, the Swains have big plans for Dog Not Gone. They’re currently working on a line of No Fly Zone maternity clothing that will help protect women from Zika virus, a mosquito-borne disease that causes birth defects and has recently spread to the continental U.S. in southern Florida. “I think especially over the next few years, with Zika on the news all the time and Lyme disease on the news all the time, we’re going to really grow,” Julie Swain said. For more information and to purchase Dog Not Gone products online, visit dognotgone.com.